David Matheny, of ESAM Inc. announced that his company received a Northrop Grumman Corporation 2012 World Class Team Supplier Award. This award is presented to those small business suppliers who have consistently demonstrated outstanding achievements and support of Northrop Grumman programs. 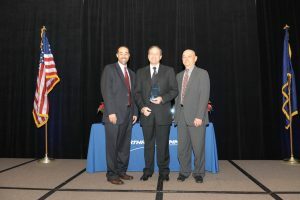 The award was presented to Mr. Matheny at the Northrop Grumman Corporation Annual Corporate Socio-Economic Business Programs Recognition Awards Luncheon on Wednesday, December 5, 2012, at the Fairview Park Marriott Hotel in Falls Church, Virginia.